Common sense, courtesy and safety are the basis of snowmobiling regulations in the state of Maine. If you know the laws, respect other people's rights and snowmobile safely, you'll have fun, rather than problems. Here's a very brief discussion of Maine snowmobile law as presented in the Maine snowmobile lawbook. These snowmobile laws can be viewed on line on the Maine Department of Inland Fisheries and Wildlife (IF&W) website. If you require a printed copy, contact IF&W, 207-287-8000. Photo By Bob Meyers: Traveling fresh snow, framed by birches. 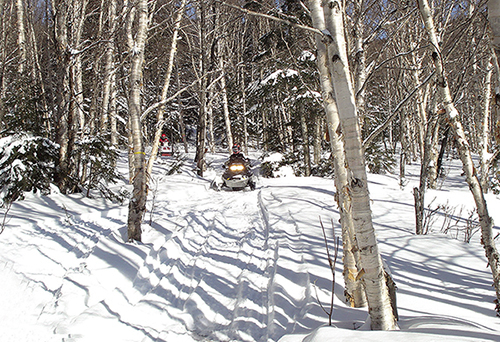 REGISTRATION: The Maine snowmobile trail system operates on a sled registration system. There is no trail pass required, but all Maine residents and non-residents must register their sleds in Maine to ride in Maine. Resident Registration is $45 (one year commencing from July 1). Non-residents have three options - a 3 consecutive day registration is $49; a 10 consecutive day registration is $75, and a full season is $99. (Plus a small agent processing fee). You can register at numerous agent locations throughout the state - a list of Registration Agents is available on the IF & W site as well (scroll down their page to view the list). You can also register through the mails or purchase a resident renewal or non-resident season registration on-line on the IF&W web site . WHERE THE MONEY GOES: Much of the registration money goes to the Snowmobile Trail Fund of the Department of Conservation, Bureau of Parks and Lands where it is distributed through grants to snowmobile clubs, towns, etc. to develop, construct and maintain snowmobile trails and assist with the purchase of grooming equipment; a portion is credited to the Department of Inland Fisheries & Wildlife for snowmobile enforcement and related expenses, some goes to the state's general fund and, in the case of Maine residents, a percentage is distributed to their municipality. In a number of cases, the municipalities will return those funds to the local snowmobile club to assist with their trail activities. WHERE YOU CAN RIDE: There are over 14,000 miles of snowmobile trails in Maine, and (depending on the snow cover), your registration allows you access to every mile. There are many places where you cannot operate a snowmobile: You may not operate a snowmobile in a cemetery; within 200 feet of a dwelling, hospital, nursing home, convalescent home or church; along or adjacent to railroad tracks without the written permission of the railroad; across the tracks of a railroad if forbidden by the railroad or if the tracks are posted. On a plowed road, sleds need to travel off the portion of road used by motor vehicles and only for a very limited distance - if you're crossing the road, 300 yards - if you're crossing a bridge, overpass or underpass, 500 yards. Some communities do designate snowmobile access routes into their town in order for sledders to get to gas stations, restaurants, etc - these should be well marked and noted on the local trail map - travel slowly and to the extreme right when using these routes. Never ride on any property, unless you are on a signed snowmobile trail, without the landowner's permission. Check your snowmobile law handbook for further details on where you can and can't ride. The best way to enjoy snowmobiling in Maine is to get hold of a trail map and ride on the groomed and marked trail system where landowner permission has been obtained for everyone, snowmobile laws have been complied with, trails have been maintained, snow has been groomed, and signs are in place. That's where you can ride without concern of breaking the law, irritating a landowner, waking up the baby, damaging forest growth and cropland or disrupting Sunday services. SPEED: There are no speed limits on Maine trails. Sledders are judged by the standard of "reasonable and prudent speed for the existing conditions". Reasonable means remembering that many families are out riding together, enjoying the outdoors. Slow down when you meet other sledders, ease up when you come to a curve, bridge or rise in the trail. If you are unable to control your sled enough to keep it to the right hand side of the trail and stop in a safe and prudent manner - you're speeding. RECKLESS OPERATION: It is illegal to operate a snowmobile in a manner which endangers another person or property. OUI LAW: Maine has a tough OUI law with penalties for operating or attempting to operate a snowmobile under the influence of alcohol or drugs. 21 years of age or older: .08%. Under 21: any amount of alcohol. The MSA has endorsed zero tolerance of alcohol/drugs while operating a sled. BORDER CROSSINGS: You must stop at customs to cross the Canadian border. Travel with the same paperwork you would carry if you planned on touring Canada by automobile - passport/passport card, proper registrations and insurances. Contact the Quebec Federation of Snowmobile Clubs (514)252-3076 or the New Brunswick Federation of Snowmobile Clubs (506)325-2625 for information/required paperwork for snowmobiling in their provinces. Crossings in Jackman and in Fort Kent are open 24 hr/7 days a week, as are major crossings into New Brunswick. Some less traveled crossings have limited hours of operation, so check locally and plan your trips accordingly. If you are planning to ride into our neighboring state of New Hampshire, contact the New Hampshire Snowmobile Association at (603)224-8906 for information regarding snowmobiling in their state. LAW ENFORCEMENT: You must stop for game wardens, foresters, rangers, troopers, local law enforcement - anyone in uniform who asks you to halt. You also need to stop for any landowner who asks you to - it's their property! Safest bet is to come to a halt for anyone who is flagging you down on the trails and find out what it is that they want. LANDOWNER LIABILITY: Maine has a solid landowner liability law. The people of Maine have a long tradition of generously sharing their land with others for recreational use, and a real Maine sportsman would never jeopardize that tradition by holding landowners responsible for a recreationist's actions. Snowmobilers, hunters, hikers, ATV operators, bikers, fisherman - people whose recreation depends on access to privately held land, all strongly support this law that protects the landowner who allows us access. ABUSE OF ANOTHER'S PROPERTY: It seems incredible that laws must be on the books to keep recreationists from damaging the property of the very people who allow them access, but unfortunately some people just don't get it. If a snowmobiler tramples or destroys crops, tears down or destroys a landowners fence or leaves open a gate or bars on someone else's land - they are guilty of the crime of abusing another's property. If a person enters someone else's property and breaks glass, damages the road, draining ditch, culvert, bridge or any other structures and dumps litter/trash in any amount, they're breaking the law. If someone destroys, mutilates or defaces the landowner's signage, they are breaking the law. We're all guests on Maine's snowmobile trails - stay on the marked trail, carry in carry out, and respect both the land and the landowner. SNOWMOBILE ACCIDENTS: If you have the misfortune of ending up in a snowmobile accident which results in a fatality or an injury requiring the services of a physician, you or someone acting on your behalf must give notice of the accident by the quickest means possible to the nearest law enforcement officer. If you are in an accident which results in property damage only of $1000 or more, you must report the accident within 72 hours using a form provided by the Maine Dept. of Inland Fisheries & Wildlife - these forms are available at branches of the Maine Warden Service and area dealerships - and online at the IF & W web site. That's a very quick overview - there's much more specific information in the Maine Snowmobile Law handbook, so be sure to become familiar with it.